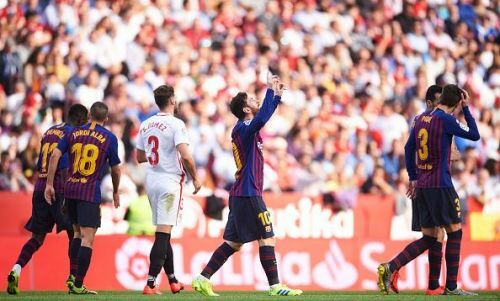 Sevilla hosted FC Barcelona on matchday 25 of LaLiga 2018-19. The Andalusian side was in a cold run of form, winning only four points from the last six matches they played in the league. The Blaugrana were no better, considering current form. They were yet to win convincingly in the month of February with their only win coming against Valladolid by a 1-0 margin. Barcelona started with Busquets, Vidal, and Rakitic in their midfield. 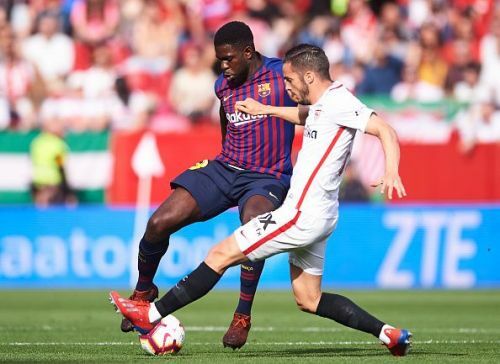 Samuel Umtiti returned to the starting lineup following a long injury layoff. Philippe Coutinho also returned to the starting 11. Sevilla started with a 4-4-1-1 formation with Ben Yedder taking up the striker's role. Jesus Navas and Quincy Promes started in the wide midfield area. Sevilla opened the scoring with Jesus Navas in the 21st minute. Lionel Messi set things to level 5 minutes later with a tremendous volley. The home team though got their lead back just before half-time through Gabriel Mercado. What followed in the second half was the one-man show from a diminutive Argentine. Two goals and an assist from Lionel Messi and Sevilla were left wondering what they did wrong. The Blaugrana extended their lead over Atleti to 10 points until they play Villarreal later today. This game sets the momentum going for two consecutive Clasicos at the Santiago Bernabeu. Let us look at hits and flops from the game. We understand that it is harsh on the Frenchman particularly since he has just returned from injury. Umtiti returned to defensive duties following a long layoff and against a side that was pressing the life out of Barcelona. Umtiti did not do much worse if we look at stats. He made three interceptions, a tackle, and he made some clearances as well. But when we look at positioning and intent in the defence, he lacked it. Gerard Pique was clearly the lone soldier in the defence and many times covered up for Umtiti's low confidence and errors. We know Umtiti is supposed to be on the left side of the side, yet who attempted to block Navas' shot at goal? Pique did. Umtiti on the retreat was showing his back to Ben Yedder instead of attempting to get the ball or put in a last-ditch tackle. We know he is capable of doing both. During the second goal, Sarabia is about to cut the ball back to Mercado, Pique is busy appealing for a goal kick and yet gets a tackle in and gets all the slander. Umtiti just stands there in the box, completely out of his defensive position, and he wasn't at the far post as well. If Umtiti had kept his defensive position in both cases, he could have intercepted the pass that created both goals. Gingerly on the return, hopefully, he will be back to his normal self, because this isn't Samuel Umtiti.